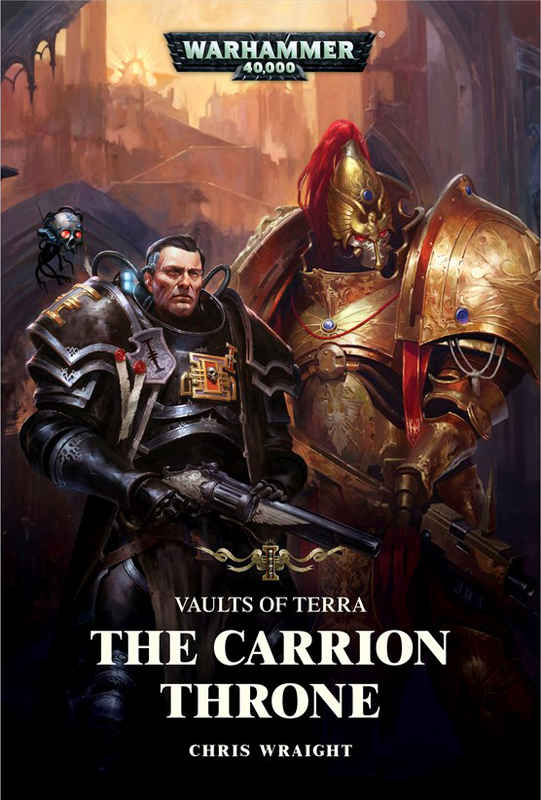 If you are into INQ28 (or Inquisitor in general, for that matter), I cannot recommend the book enough: It has shady inquisitorial dealings galore, it features the Legio Custodes (technically a bit of a spoiler, but there’s that very blatant cover artwork, so yeah…) and it’s set on Holy Terra itself — if those three points don’t sell you on the novel, I don’t know what will. Anyway, it’s a great read! But then I never painted her, for some reason. I think I had this very clear idea what I wanted her to look like and was really nervous about messing up the execution. What’s more, it felt like the entire retinue, completely built and assembled at this point, hinged on my success with this particular model. So I set her aside, to pick her up and sigh theatrically every now and then, and that was that. I am not going to lie to you, I was completely right to be afraid of this paintjob: The old metal model was full of strange nooks and crannies and had some weird issues, and that softly detailed Wood Elf face almost drove me mad. At the same time, the painting felt more freeform and painterly than I was strictly comfortable with, especially since I went with a somewhat experimental way of painting the armour, using an almost impressionistic approach to create depth. 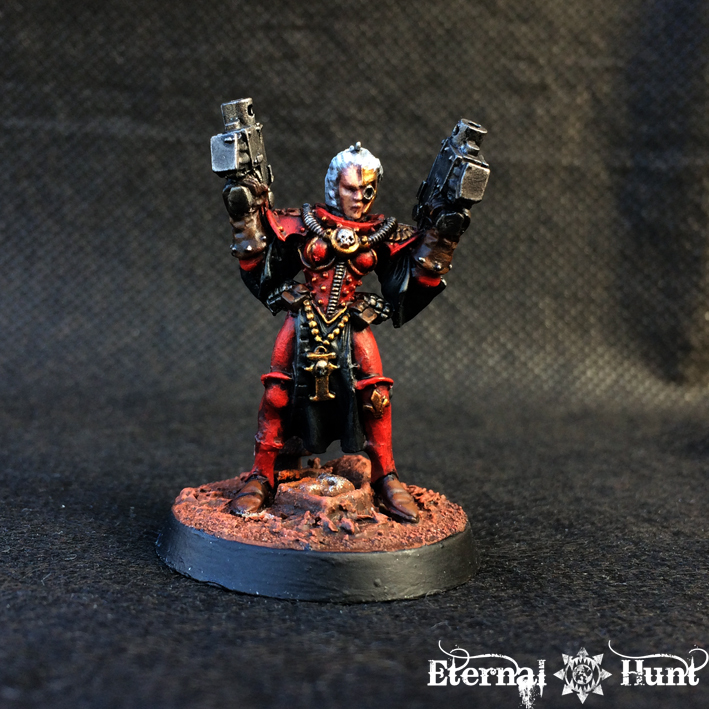 The idea here was to go with a very classic Ordo Hereticus approach of red, black and gold: I wanted the model to look slightly sinister, but also regal, with the ostentatiousness of those perfectly assured in their righteousness. 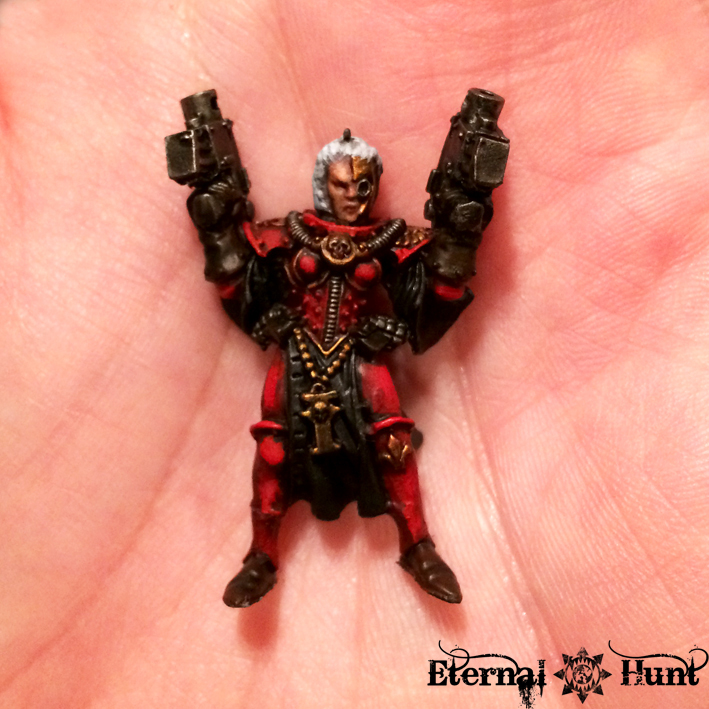 At the same time, I also used a scheme that inverted the colour scheme for the Order of Our Martyred Lady, the posterboy…erm “postergirl” Adepta Sororitas colours. I see Chastity as a former Sister of Battle turned Interrogator, and I liked the idea that her look still echoed her former position. Here she is. 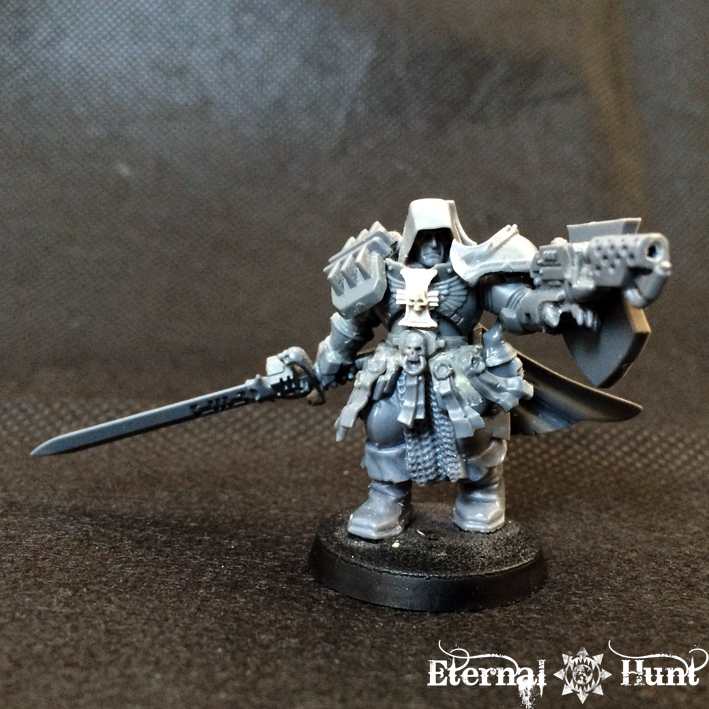 next to an older, kitbashed Sister of Battle I made, Sister Euphrati Eisen of the Order of the Martyred Blade — maybe her former sister in the order…? She still needs a last name, by the way, so feel free to send some suitably grimdark and/or phonetically pleasant suggestions my way! 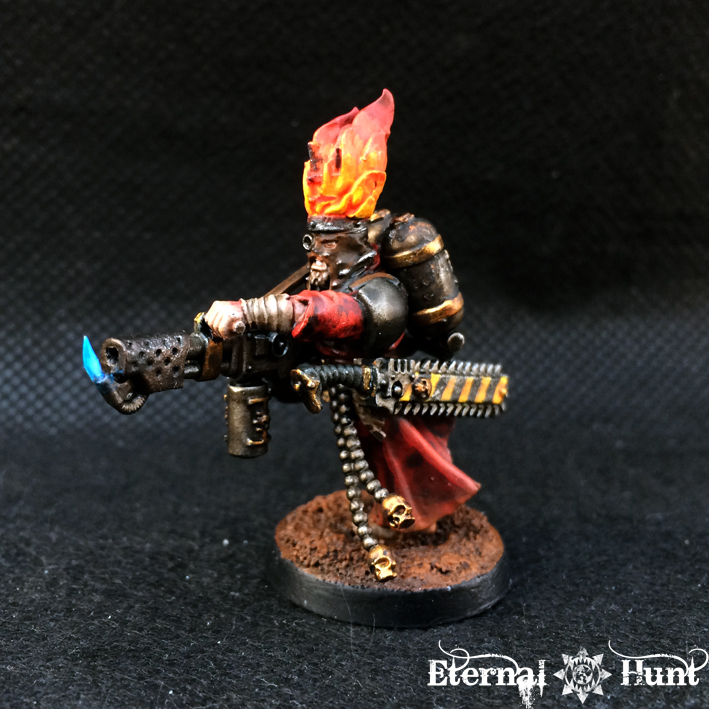 In any case, though, a redemptionist surely seemed like an appropriate henchman for a traditional fire-and-brimstone Ordo Hereticus Inquisitor. 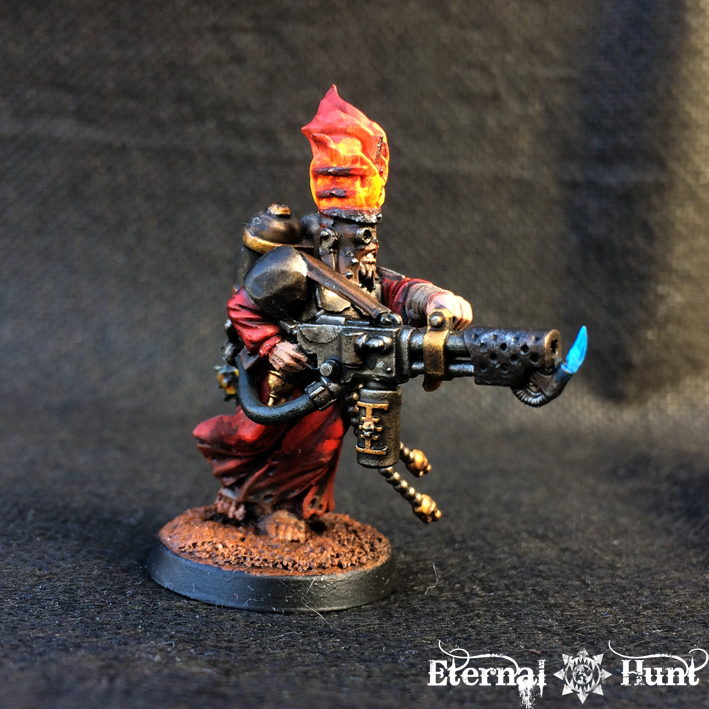 For the most part, I tried to go with a very classic redemptionist colour scheme. 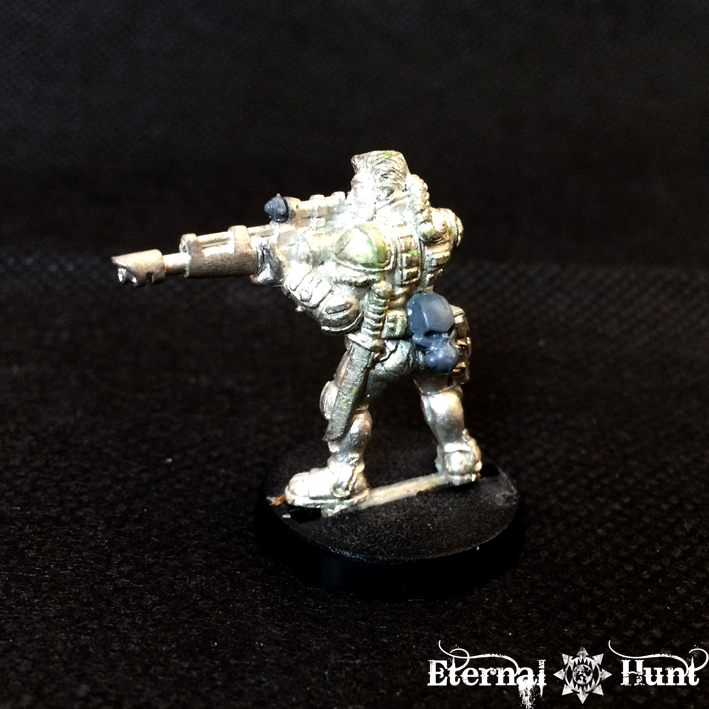 There are some touches I am pretty happy with, though: The hazard-striped eviscerator works as a callback to the classic Necromunda look. 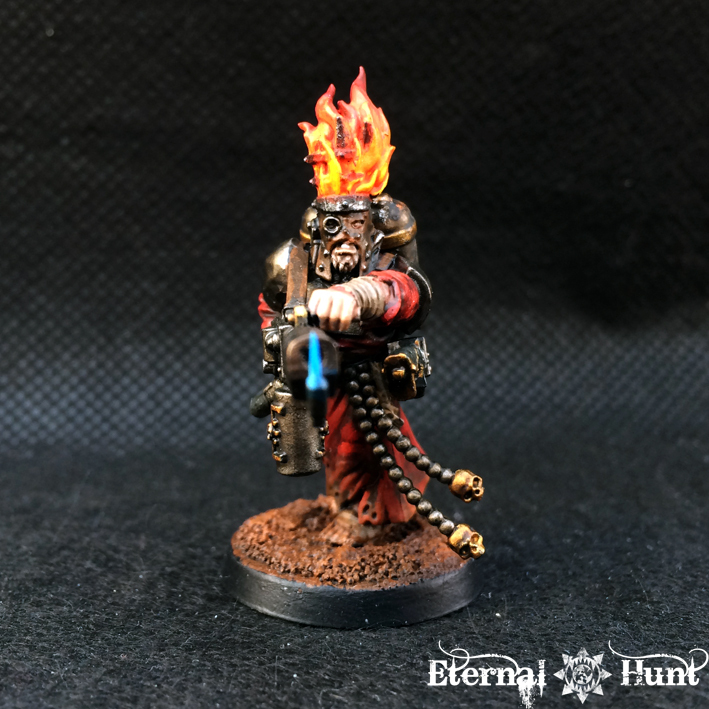 The pilot flame was a spontaneous idea that came to me in a moment of inspiration, and it’s a detail that I am now stupidly happy with 🙂 It also has the added benefit of providing a bit of a visual flourish to that rather boring flamer nozzle. One thing I am really not sure about is whether or not I should add some Imperial/Inquisitorial decals to his shoulder pads (in white): Would that improve the model, or would it detract from it? I would be happy to hear your feedback on that! 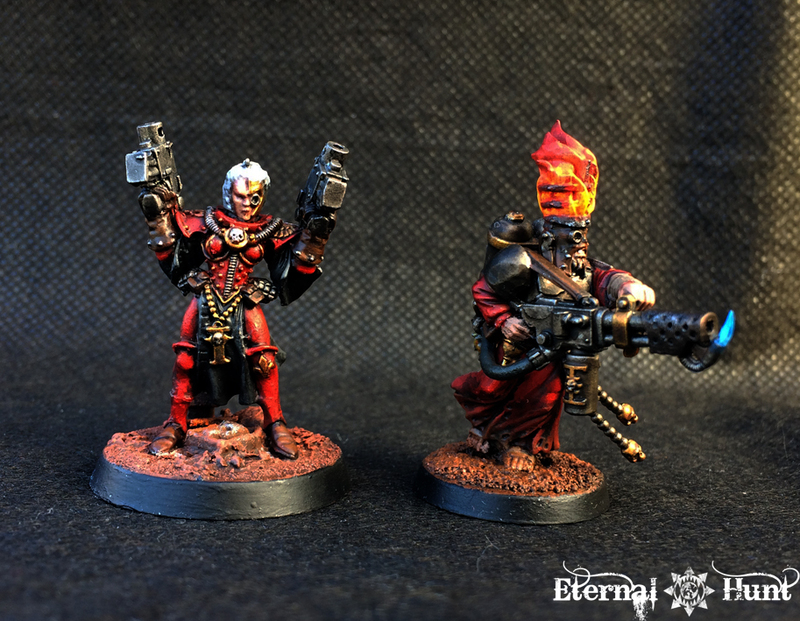 So I already have two finished models for the warband — not bad, given the fact that I didn’t really touch this project for a long, long time, right? Anyway, between these two models, I have basically nailed down the palette I want to use for the warband, so expect the other members to use different combinations and permutations of the recipes I used on Chastity and Goderich. 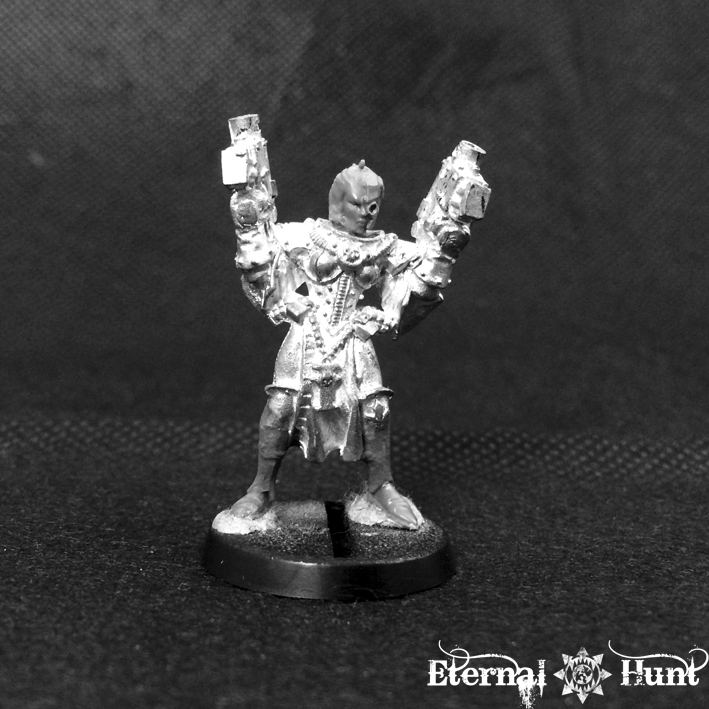 Speaking of the next models for the warband, what’s in the pipeline? I was actually wondering whether he might look even cooler with Custodian shoulder pads…?! PDH convinced me to just let it rest already and consider the model finished, after half a decade… So yeah, expect to see him with some paint on soon-ish. This is such a minuscule detail, really, and it’s hard to explain why I am feeling so pleased with myself over this idea, but I just like that bit of continuity that hints at a larger background and at the amount of worldbuilding Dexter and I have put into our shared setting. 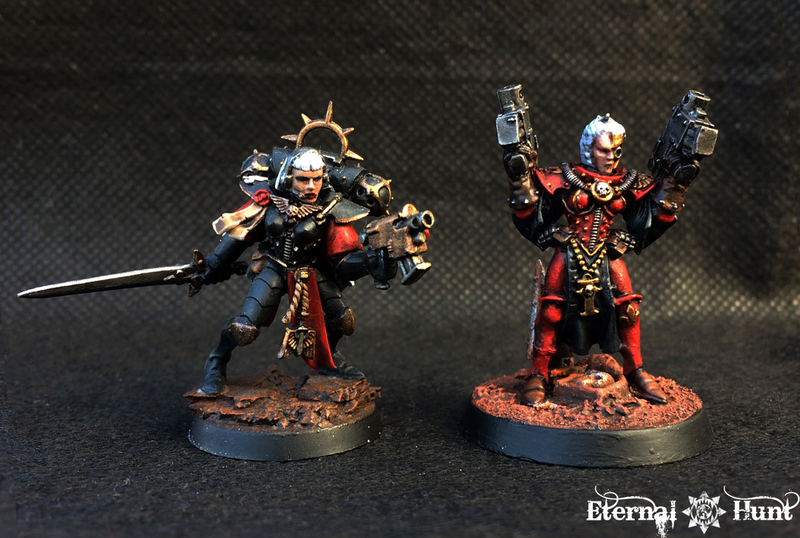 This entry was posted on February 20, 2018 at 18:12 and is filed under Conversions, Inq28, Inquisitor, paintjob, WIP with tags adepta sororitas, carrion throne, community challenge, fembruary, Inquisimunda, inquisitor, inquisitor 28, inquisitor arslan, interrogator, long neglected models, ordo hereticus, paintjob, redemptionist, retinue, sisters of battle, warband, witch hunter. You can follow any responses to this entry through the RSS 2.0 feed. You can leave a response, or trackback from your own site. Haha, maybe, given the time, money, bitz and, most importantly, attention span. Why, are you buying? 😉 As you can see, I am having a hard enough time finishing the starring roles, least of all the bit-parts. It sounds like Neil 101 might be your man, though — it sounds like a project like that would be right up his alley. Great work, the red turned out so well! 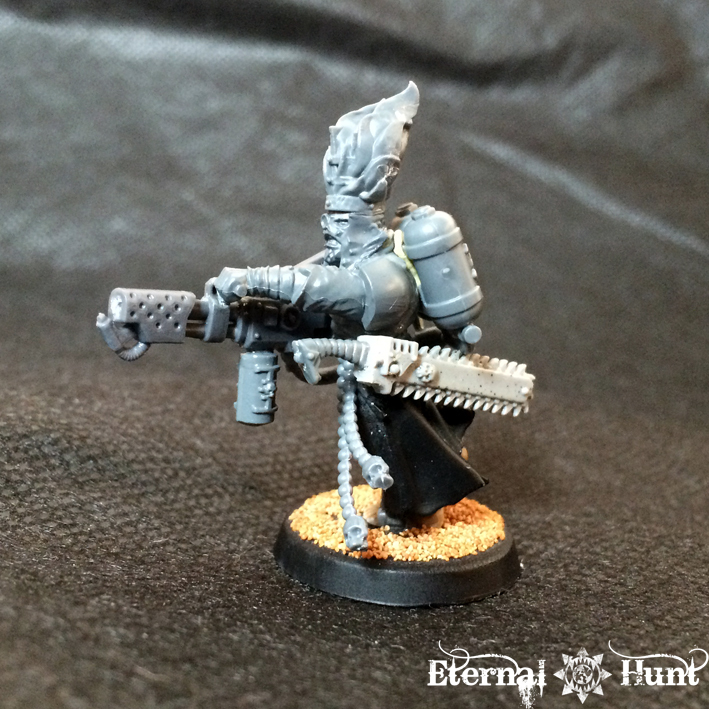 Aw, c’mon mate, you can always fit in an Inquisitor model, can’t you? As for Arsian, yes, I’m happy to nearly see him painted… But then again, if you’d not remembered him, maybe I could have bought him from you! That said, I cannot wait to see the finished product. I think that the shield doesn’t quite work where you have it on his arm, just because of the pose and the preexisting flamer, but I love the bit. I would try either mounting it on his other arm (like a D&D Defender relic sword) or slinging it across his back. That said, he’s your character, so you do what you think fits him best! 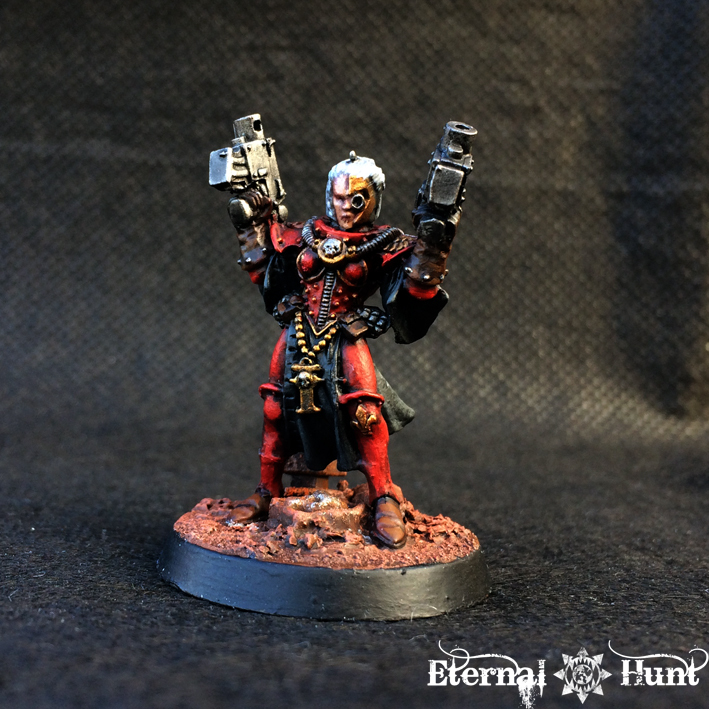 Tell you what, maybe we should talk about what you want your Inquisitor to look like via e-mail, and then I could send you some bitz to help you get your bearings? That would be kind of amazing! You don’t have to do that – shipping between Germany and the USA has got to be expensive – but thank you so much for the offer. 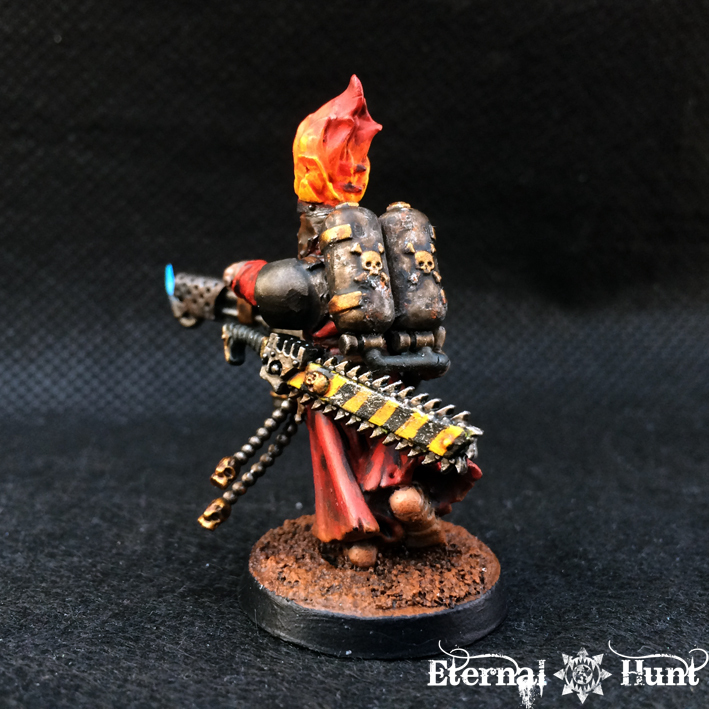 I’ve been useful on my all time favorite Eternal Hunt model’s creation. I can die happy now. 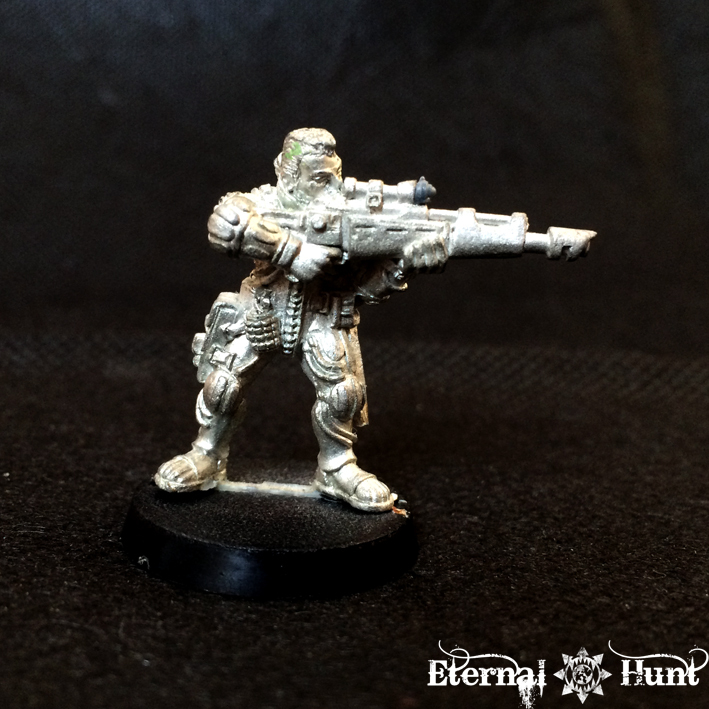 Dude, Interrogator Chastity is superb – the more freeform painting style really suits you! The reds are absolutely beautiful mate, and they just suit the mini perfectly – an excellent entry for both challenges! What a collection of characters! Sterling work, mate. Do you get much of a chance to game with them? 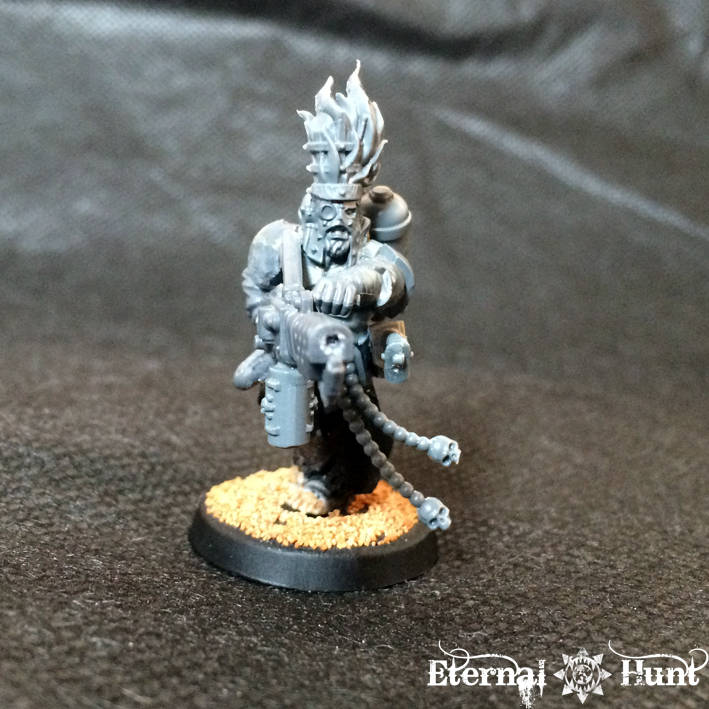 With your Van Saar guy, you’re spot on about the little details. It’s so satisfying to fiddle about, trying all sorts of little bits, and then you find the one and it all suddenly clicks. Amazing work, as always. 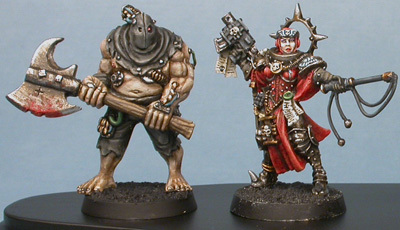 the red on Interrogator Chastity looks really great as others already said. 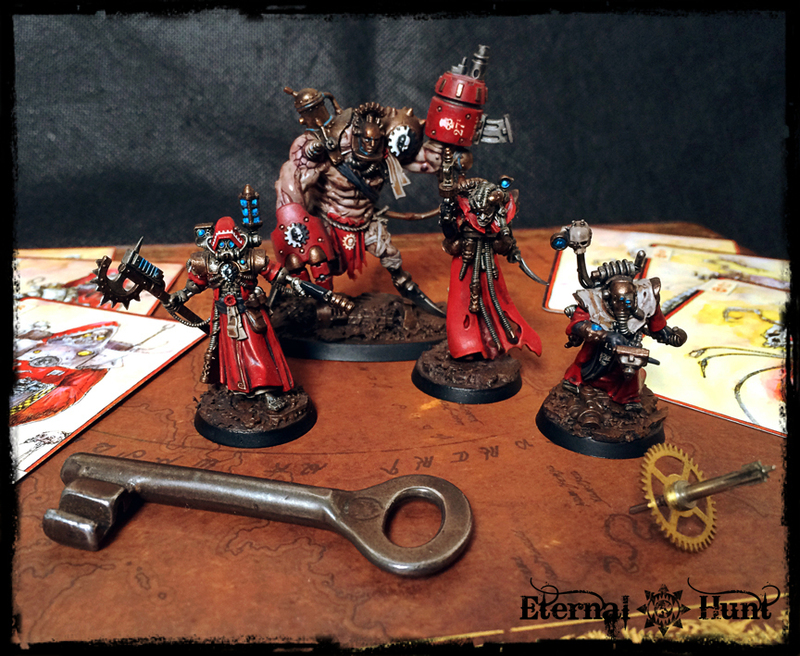 More in general, I think the Inquisition is one of the things that better define the 40k universe, maybe even more than space marines (they’re more iconic, but lack very often the subtlety and depth of actual human characters) . I’m really looking forward to reading “The carrion throne” too, and I think also John French’s “Resurrection” should be a good read, even though I saw some not really enthusiastic reviews online (but he is one of my favorite authors, so…). I would also recommend, out of INQ discussion, “Primogenitor” starring good old Fabius Bile, definitely worth it. Thanks, raff! “Carrion Throne” is a perfect look at the Inquisition, if you ask me: It has everything one could want from an Inquisition story, and it also ties into the overall lore into a surprising and satisfying way. 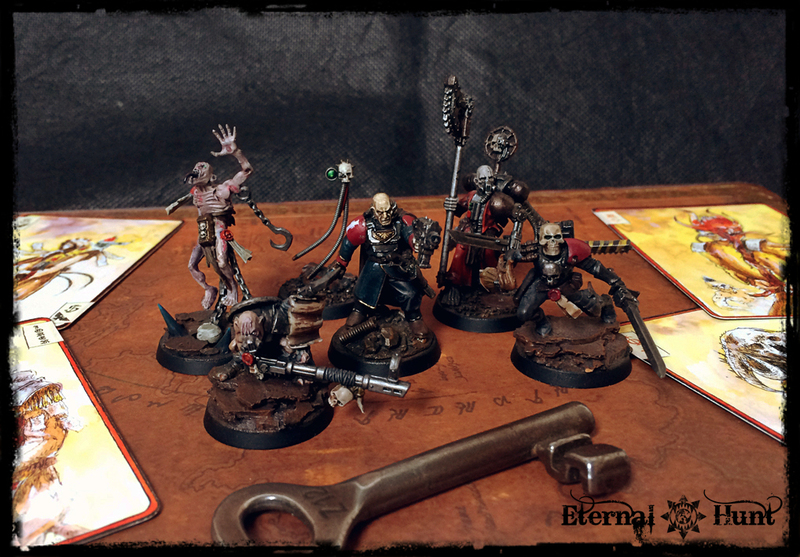 Personally, I personally found that reading both the – ancient – Inquisitor novel by Ian Watson and “Master of Mankind” by Aaron Dembski-Bowden really made the conclusion of the novel even better and more rewarding. As for “Primogenitor”, yeah, that one was great, as was its sequel “Clone Lord”. I can only recommend those as well. Great, thanks for your answer Kraut! I’m definitely adding Carrion Throne to my “to read” list, together with Ian Watson’s books. Good to know Clonelord lives up to the first book of the series, too. Oh, and that pilot flame is a great touch! Awesome job on the paint job of Chastity she look really cool! 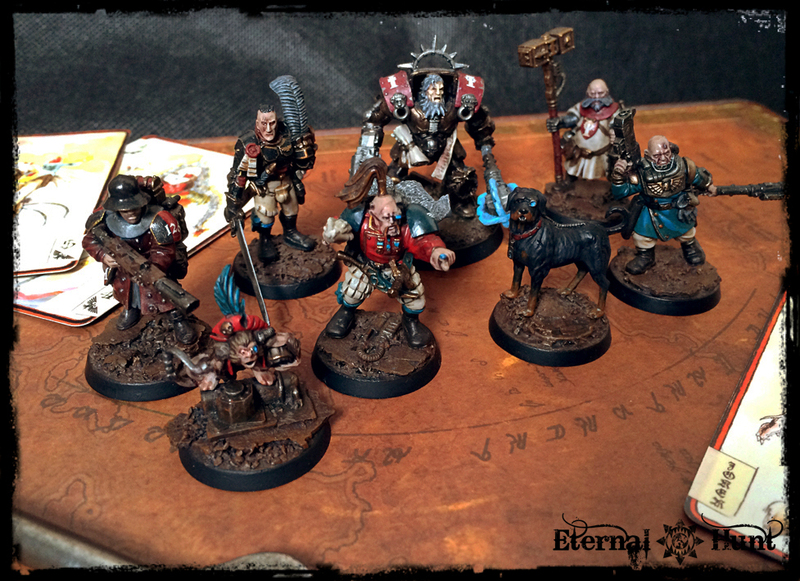 Always cool to see more inquisitor stuff from you! Also don’t worry about the last part of your ethernal hunt awards! Excellent work on the pair of them here! 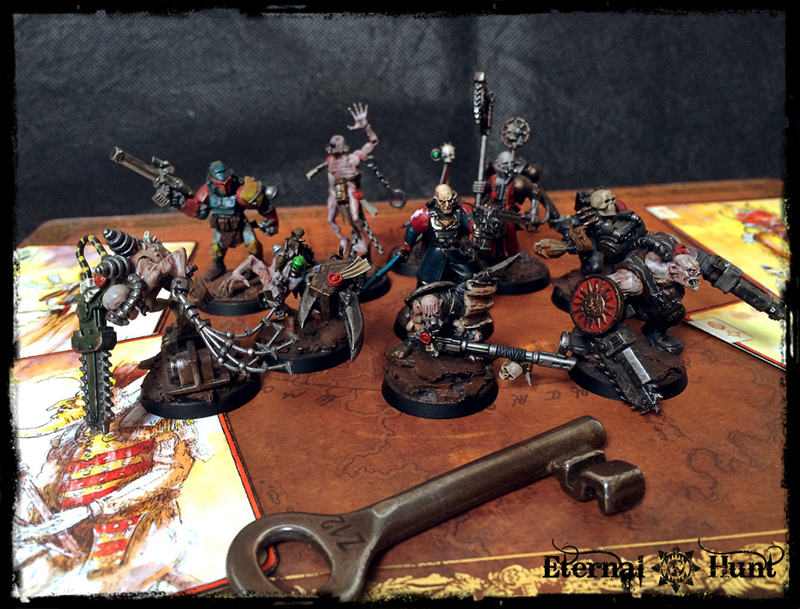 I share your satisfaction in getting some models finished so long ago done. 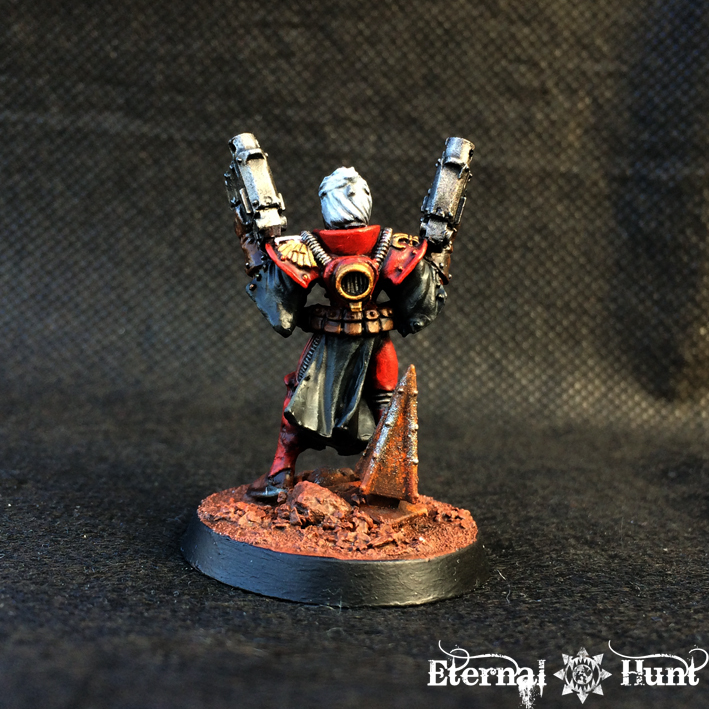 As for the question on adding some Inquisitorial seals to Goderich, I guess it depends on the primary use of the figure – if it’s to be the Inquisitorial Warband, I say go for it. If it’s equally shared between Necro and Inq28… then maybe not. 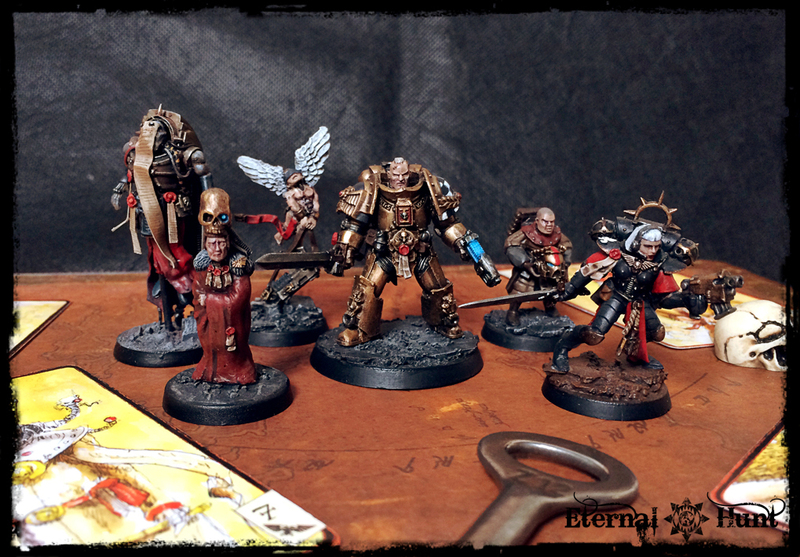 Also great to see your amazing showcase of Inq28 models on show here as well. There’s an awful lot of great work on show there! Cheers, mate! That’s an excellent point about the symbols! I think I’ll leave them off to make the model more versatile — when seen in the context of the entire retinue, Goderich still looks like he belongs even without any =][= symbols. Not only the models but the writeup is great to understand your way to approach them, the background, techniques. Thanks again! *ahem* What I meant to say is, loving both the finished models – Chastity is looking very self-confident and intimidating (I’ve always been a little unconvinced by the wood elf heads, but it works perfectly in this case!). As for Goderich, great use of bits, and again, loving the pilot flame! My gut says that an icon in white on his shoulder would be worth it, just for that little extra tying him in with Chastity. 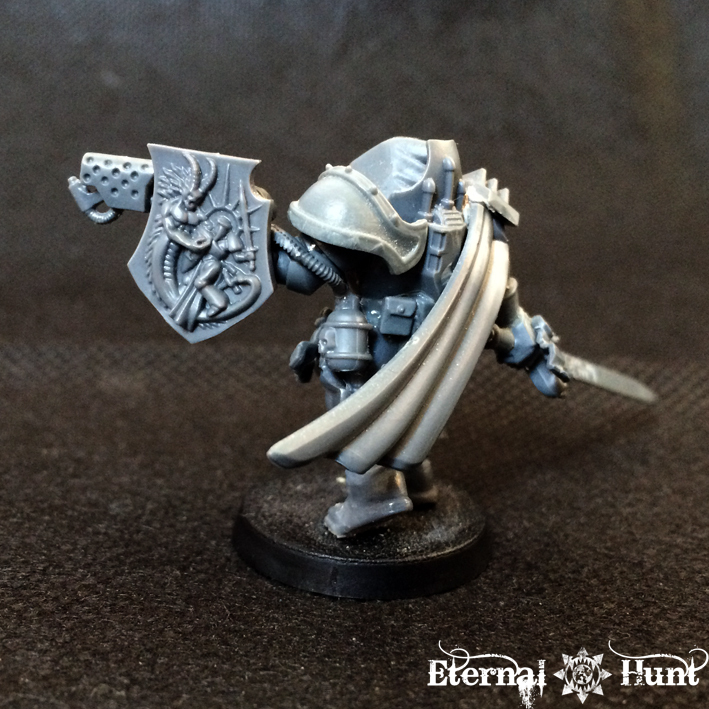 Inquisitor Arslan is looking great (is that an inverted radar dish as a shoulder pad? 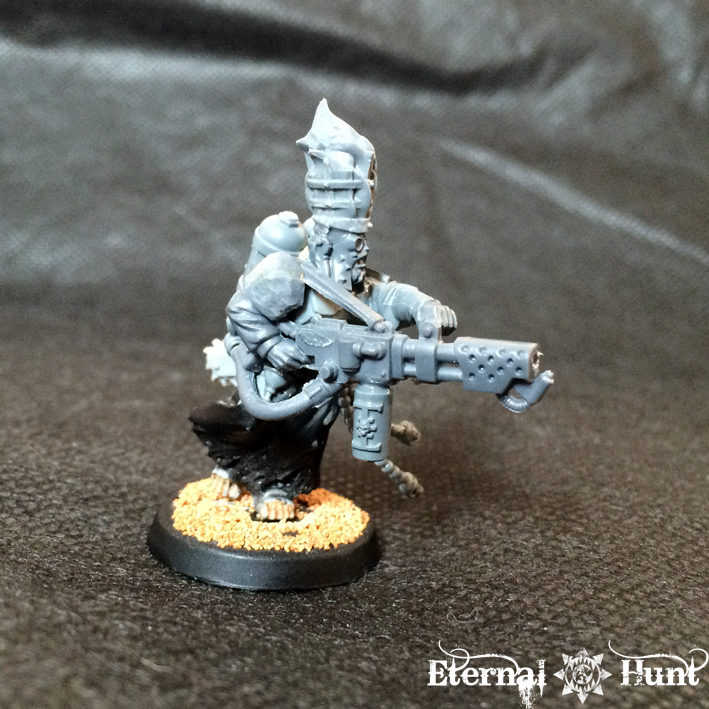 ), and the Draughar vet looks intriguing – loving the war and glamour shots, too! Back when I built Chastity, the Wood Elf head was a bit of a stopgap solution, as it was the only suitable female head I had. With the bionic eye added to that strange half-mask, I think it works really well, though, and I am quite happy with the choice in hindsight. I agree about the icon on Goderich, although Azazel rased an excellent point above about keeping off any symbols so as to be able to use the model in both settings, so I think I’ll keep him that way.